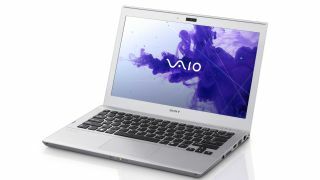 Sony has officially unveiled its first Vaio branded Ultrabook - with the Sony Vaio T series bringing an ultralight and ultrathin option to Sony's laptop range in June. Sony remains a highly desirable brand, and the Vaio T series aims to capture some of burgeoning ultrabook market. The Vaio T boasts a 13-inch screen, Intel Core i3 processor and the SSD version brings the promise of a nine-hour battery life. Of course, it's the look of the device that is going to decide its success, and as well as the always impressive Vaio screen the Vaio T boasts a 'smartly styled' magnesium and aluminium chassis. As you might expect, there are HDMI, VGA and RJ45 network ports, plus an SD/MMC media slot and Sony's xLOUD and Clear Phase audio. : "It's the first Ultrabook to proudly carry the Vaio name." "Thin, light and portable, the responsive new Vaio T Series is always ready for action," adds Sony. "Smartly styled in tough magnesium and aluminium, the go-anywhere VAIO T Series is tailor-made to handle daily trips to the office or lecture theatre. "Blending durability and performance, and loaded with the latest technologies from Sony and Intel, it's the first Ultrabook to proudly carry the Vaio name." The Sony Vaio T release date has been set as June.